It can be difficult to pay cash for your car, home and college education and that’s where credit can be helpful. It’s important to have a plan to build and maintain a good credit history. According to the Corporation For Enterprise Development (CFED) Asset and Opportunity Scorecard released in 2015, only 46.2% of Kansas residents and 50.7% of Missouri residents have prime credit. Hundreds of thousands of Metropolitan Kansas City residents need help establishing better credit. Your credit impacts the way you live. For instance, it can help you get a car with a low interest rate loan and even help you get a lower rate on your car insurance. But if your credit isn’t good or if you don’t have a credit score, your credit can work against you and cost you money. Good credit saves money; bad credit costs money. It can be difficult to pay cash for your car, home and college education and that’s where credit can be helpful. It’s important to have a plan to build and maintain a good credit history. Good credit saves money; bad credit costs money. Your credit impacts the way you live. For instance, it can help you get a car with a low interest rate loan and even help you get a lower rate on your car insurance. But if your credit isn’t good or you don’t have a credit score, your credit can work against you and cost you money. Find out more information about What a Credit Score is? What is a Credit Report? 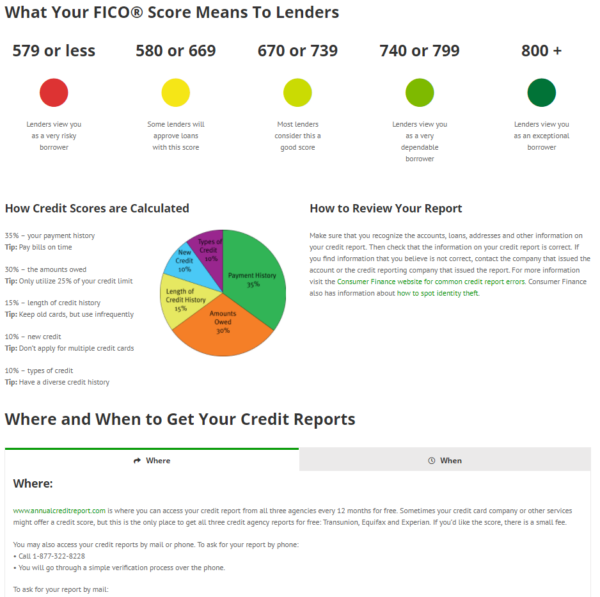 How to Read a Credit Report? and much more HERE! Check out the Do’s of Credit below for tips. Don’t pay someone to do what you can do for free. Any changes that can be made to your credit report can be done by you. If there is an error on your report, you can dispute it by directly contacting the credit bureau through its’ website, over the phone or through the mail. Beware of quick fix credit repair agencies. Here are some great debt calculators: Apprisen Calculators, Debt Calculator, Multiple Calculators. If you would like assistance building your credit, check out the local resources below. DO know the power of credit. By using credit wisely, you can build a good credit history which makes it easier to get loans with low interest rates, rent an apartment, purchase a car or home, and may even help you get a job. DO start small. When establishing credit, go to your local bank for a small loan or low credit limit. DO read the fine print on the credit application. The application is a contract, so read it thoroughly before signing. Interest rates, credit limits, grace periods, annual fees, terms and conditions vary. Also, watch for terms such as “introductory rate” and “grace periods” that can change. DO understand the Annual Percentage Rate or APR. Simply put, APR is the interest rate or the measure of cost for credit. DO set a budget and stick to it. A realistic budget will allow you to pay down your debts while saving and keep your finances in order. DO open your bills immediately and compare charges with receipts. This helps protect you from identity theft and unauthorized charges. DO pay at least the minimum amount due, on time. This will help you to avoid late fees and a rising APR. To pay off your balance quicker, pay more than the minimum due. DO contact your creditor if you have trouble making payments. Let creditors know your situation and they may try to work with you to create a more manageable payment plan. Take action immediately to keep your account from being turned over to a debt collector. DO be wary of anyone who claims they can “fix” your credit report. No one can legally remove negative accurate information from your credit history. The only thing that can fix a credit report is time and a positive payment history. Find a non-profit credit counselor at nfcc.org. DO keep your credit card in a secure place. Only carry the cards that you think you’ll use. Always have your creditor’s phone number available in case your card is lost or stolen. DO order a copy of your credit report annually. The Fair Credit Reporting Act requires each of the 3 major credit bureaus to provide you with a free copy of your credit report at your request, once annually. Your credit evaluates your performance as a borrower and needs to be accurate. To obtain a free copy of your credit report, visit www.annualcreditreport.com. DON’T feel pressure to get a credit card. If you don’t want one, you have the right to say “no” to solicitors. If you are receiving prescreened or preapproved offers and you no longer wish to receive them, you can opt out. Call toll-free 1-888-5-OPTOUT (1-888-567-8688) or visit www.optoutprescreen.com for details. DON’T open a lot of credit accounts within a short period of time. This may have an adverse effect on your credit report. DON’T pay your bills late. Late payments can affect your credit rating and increase your balance. DON’T spend more than you can afford. It is your responsibility to manage your debts and to keep your commitment with lenders. Avoid reaching your credit limit or “maxing out” your cards. DON’T ignore the warning signs of credit trouble. If you pay only the minimum balance, pay late, use cash-advances to pay daily living expenses or transferring balances you might be in the “credit” danger zone. Seek professional advice or financial counseling to regain control of your finances. DON’T share your credit card number. Never give out credit card or personal information if you have not initiated the transaction. Be aware of identity theft and phishing scams that ask for credit card numbers. If you suspect that you have become a victim of identity theft, file a complaint with the Federal Trade Commission. Call toll-free 1-877-ID-THEFT (1-877-438-4338); TDD: 202-326-2502, or visit www.ftc.gov/idtheft. Developed by a trusted nonprofit organization. Recognizing the need for results driven credit building and restoration services, CHES, Inc. developed an effective financial & credit counseling, education & coaching program. Participants can track their progress and communicate with their coach in person, online, or via smart phone – a program designed to fit your busy lifestyle. To request education for your workplace or organization, please click here or call one of the education contacts in your area. Workplace Education Page click here. Annual Credit Report: Get a free copy of your credit report every 12 months from each credit reporting company. Apprisen Credit Report Resources: Access credit report request forms, and additional information from annualCreditReport.com, ScoreInfo.org and FTC.gov. Equifax: Access your Equifax credit report and credit score for a fee. Experian: Access your Experian credit report and credit score for a fee. My Fico: Pay a fee for a FICO credit score and either 1 report or all 3. TransUnion: Access your TransUnion credit report and a credit score for a fee. CFPB – Whether consumers are applying for a mortgage, choosing among credit cards, or using any number of other consumer financial products, the CFPB wants to ensure that consumers get the information they need. Federal Citizens Information Center – The Federal Citizens Information Center offers important consumer information and publications to help individuals make life decisions. FDIC’s Money Smart – Consumers, bankers and community service providers can use free FDIC Money Smart tools to teach or learn about basic financial topics. It is also available for different age groups and in nine languages. The program also helps new and aspiring entrepreneurs understand business financial basics. Federal Trade Commission – If you are choosing a credit card or wondering whether offers of credit and loans are on the up and up, these tips can help. Learn about Credit Reports – Understanding credit reports so that you can make wise financial decisions. My Money – The federal government’s website for information on handling personal finances with helpful resources from more than 20 federal agencies. Consumer Action Handbook – Order a FREE Consumer Action Handbook with many tips on credit and many more financial capability subjects. Consumer Financial Protection Bureau (CFPB) – Provides a list of credit card companies that provide their customers with free and ready access to their credit scores. Experian Credit Blog – Check out Experian’s credit education tools and blog to get answers to your credit questions. How to Dispute a Late Payment?